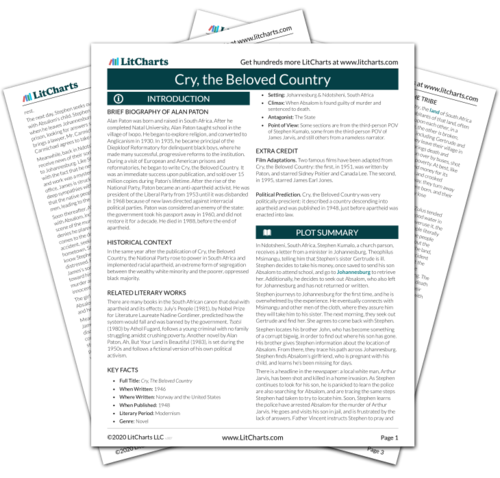 Instant downloads of all 942 LitChart PDFs (including Cry, the Beloved Country). 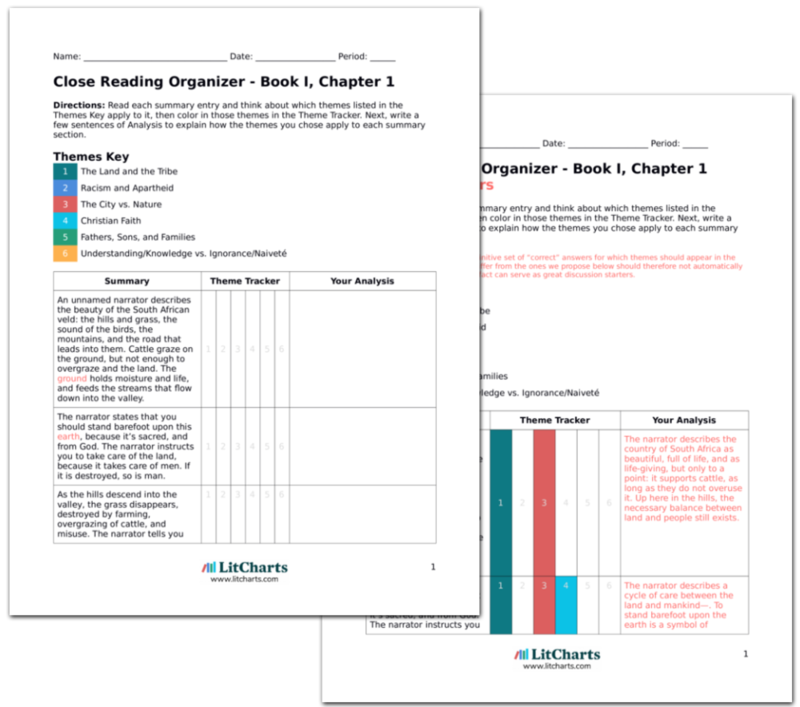 LitCharts assigns a color and icon to each theme in Cry, the Beloved Country, which you can use to track the themes throughout the work. Letters arrive in Ixopo for Stephen. One of them is from Mr. Carmichael. It explains that there was to be no mercy, and Absalom would be executed in just over two weeks. Stephen shows the letter to his wife. She looks heartbroken as she reads the letter, but then tells Stephen that he should try and keep his mind busy by going about his duties for the day. Stephen then reads another letter, from his son. Absalom repeats that there has been no mercy, but that they are kind to him in the prison. As Stephen reads these letters, dark clouds roll through the sky—soon, they will have rain. Stephen learns that there will be no mercy for his son. His wife’s stoic strength emerges yet again. The presence of rain clouds that will break the drought suggests that some of the problems of the land are going to be fixed, soon. When Stephen goes outside, he sees a strange scene—the magistrate, James Jarvis, and other white men are arranging sticks in the ground near the church. The storm clouds grow fiercer and fiercer, and the storm comes up so quickly that James has to take shelter inside the church with Stephen. Inside, the roof leaks heavily from the rain. They spend some time there, waiting for the storm to stop. James asks Stephen if there has been mercy for Absalom, and Stephen shows him the letter. James tells Stephen that he will think of Absalom when that day comes. The rain stops, and James leaves. Stephen is so preoccupied with his thoughts that he does not thank James for the milk, or say anything else to him. The storm that breaks the drought is efficient, but also causes a lot of damage, suggesting that fixing a broken system takes painful loss. This is reiterated as the father of the man who lost his son, and the father of the man who is about to lose his son, stand under the leaking roof of the church, that symbol of religious faith which seems to be losing its power in South Africa. That night, the community is puzzled about the nature of the sticks in the ground. The children play games around them. The man with the milk makes his delivery, and asks Stephen what they are for, but Stephen says that he does not know. The people of Ixopo don’t understand how this new thing will help them, but soon, they will learn, and be able to take part in their own revival. Machado, Carmen. "Cry, the Beloved Country Book III, Chapter 32." LitCharts. LitCharts LLC, 5 Aug 2013. Web. 18 Jan 2019. Machado, Carmen. "Cry, the Beloved Country Book III, Chapter 32." LitCharts LLC, August 5, 2013. Retrieved January 18, 2019. https://www.litcharts.com/lit/cry-the-beloved-country/book-iii-chapter-32.